What’s The Best Shock Collar? Shock collars were made and first used for training dogs in the 1960s. Nowadays, the shock collar is used to eliminate dog’s bad behaviors such as excessive barking and aggression. It is also used to train your dog to be disciplined; teach him how to stay close even without a leash, or sit or behave when you told him to. Unlike others might think, using shock collar is not something that would hurt your dog (if used as advised and take safety precautions when using it). It’s also not made for punishment, but just to train the developing negative behavior the dog have. The idea was, the dog will associate the nervous shock (yes, it’s painful but not harmful and damaging) with his negative behavior. Upon associating his bad habit with the nervous shock, he will learn not to repeat the bad habit he is doing it will come to the realization that it is a bad thing. The shock released by the collar is controlled, so you don’t need to worry about hurting your dog; as I mentioned, it might be uncomfortable, but not harmful. 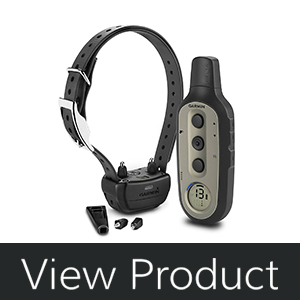 Shock collar also sends warning before the shock, and your dog will recognize it too. The warning might be a beep, vibration, or in the form of light. If it would register to the dog, he will stop upon the warning since he knows that the shock will follow. You might be a little hesitant to buy it, but as long as you’re using a legit shock collar, there won’t be a problem. If you’re looking for a legit collar that would suit your dog, here are some of the best shock collars in the market according to our research. “SportDOG Brand is the most recognized collar brand in the remote dog collar world and makes some of the best dog training collars on the market. SportDOG 425 Field Trainer is for training your dogs to eliminate bad behavior and assist you in teaching new good habits. This device claims to be the most cutting-edge training collar available in the market. This one is very lightweight; the receiver and collar weigh 3.3 oz, including the straps. This one is good for home dogs. The range can cover up to 500 yards well in the field and made possible with the perfect static collar feature. Although this device is advisable for home dogs, it can also be used for close range hunting dogs. This also has a Drytek Technology that makes the device waterproof. No need to worry about it getting damaged with water. It can withstand being submerged up to 25 feet under the water. It has 7 levels of stimulation plus vibration and tone that can be switched instantly and its system has a rapid 2-hour rechargeable battery, which is designed to last for up to 50-70 hours depending on the frequency of used. It has 7 levels of stimulation that you can adjust. Long lasting battery life. Can be used for up to 50 to 70 hours without charging. Has a range of 500 yards. It’s waterproof; good to use even when your dog is swimming. It’s only for dogs 8 pounds or larger. The Delta Sport XC trainer by Garmin Company has a tri-Tronics technology that to provide a wide range of in sight (up to 3/4 miles) training, from hunting to behavior and obedience. It gives the trainers and owners of dogs more control and simplicity. The controller has a 3 button. One button is the false correction control which allows you to counter false stimulation to your dog if you accidentally pressed the shock button. Wrong signals and stimulation might lead your dog to confusion and to avoid that, Garmin developed the false correction control button which is unique. 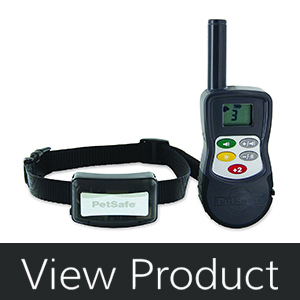 The remote transmitter also has an LCD screen and compact dog device with changeable contact points (long and short). The level of stimulation is up to 36 levels. You can choose if it’s continuous or momentary stimulation plus a tone and vibration feature. There are five available configuration corrections. You are also free to set the device if you want to train more than 1 dog (although you need to purchase an additional collar for this). Another good feature is a fully adjustable BarkLimiter with Advanced Bark Correction for more effective training in the field and a quieter kennel at home. The bark limiter feature recognizes the difference between wanted and unwanted barks as well as vibration from scratching and scraping or from other dogs’ barks. It virtually eliminates false and over correction. You can adjust the levels on the BarkLimiter and control it from the handheld allowing you to train even in BarkLimiter mode. This one is also water resistant. The battery is a lithium-ion battery in both the transmitter and dog device that lasts for a long period of time. Intuitive 3-button handheld controller with easy to read LCD and built-in BarkLimiter. Train 1, 2 or 3 dogs, settable on the handheld (with the purchase of additional dog devices). Water-resistant and with long lasting battery life. You need to be careful when setting in the bark mode since the shock can be a little high. Set it accordingly so you won’t hurt your dog. This device is a clicker training and E-Collar training combined. This innovative training tool is simple but effective in shaping your dog’s basic obedience. Clicker training is one of the oldest forms of training and is believed to be more powerful that verbal commands. Combining clicker training with e-collar creates endless possibilities to train your dog into a perfect companion. Use both negative and positive reinforcements with one convenient and easy-to-use system. The pet-friendly plastic contact points, reduced-sized receiver and detachable strap make this unit convenient for you and your pet. Stimulation levels can be adjusted from 0 to 100 ensuring the proper correction for your dog’s temperament and the range will reach up to 100 yards. This is a water-resistant handheld transmitter, the collar/receiver is fully waterproof, and is user-friendly. It has a distinct and consistent click. There are pet-friendly plastic points for added security. The straps are detachable and changeable. The receiver is lightweight and perfectly fits the hand. Coin Lithium batteries for long lasting battery life. The collar is waterproof which is good if your dog loves playing with water. The stimulation is up to 100 levels and the range is 100 yards. It seems a little overkill in the setup, plug-in set up, buttons at first, but after you figure it out it works really well. You want to train your dog on the yard or in the park? You can, even without the leash. PetSafe Elite Series Little Dog Remote Trainer has a very light and sophisticated design, it would look lie your dog is just wearing an accessory. 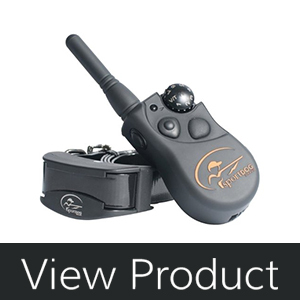 Controlled using the remote transmitter, the signal will be sent to your dog’s collar even if he’s as far as 400 yards. It will send a static stimulation that is annoying for your dog to stop disobedience, but it would not harm him. The Elite Little Dog Remote Trainer is a reliable, versatile, easy-to-use tool to help you train your dog off-leash. It can also be used for two dogs, although another collar will be purchased separately. This device is for dogs who are 8 to 40 pounds. It has 15 levels of static stimulation level but you can boost it using the plus 2 boosting button in the remote transmitter. If your dog is not super stubborn and follows your command even just using sound stimulation, you can use the tone-only mode where you get the attention of your dog by using a beeping sound. The material used for the collar is a soft material and guarantees that your pet would not get irritated. The collar is waterproof so your dog can freely play with water. It has 15 levels of static stimulation and can be boost by boosting button. The design is stylish and sophisticated. 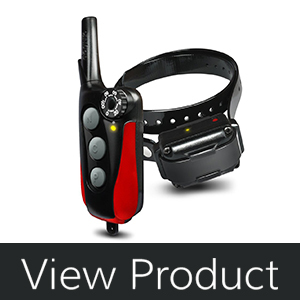 The signal can travel from the remote transmitter to the collar receiver up to 400 yards. It has a full and low battery indicator so you would know if you need to have the device charged. The “shock” is more of a low vibrate that can be pumped up for more of an actual shock. Can fit up to 22” inches dog neck. It’s intended for dogs who are for dogs 8 – 40 pounds. The remote is not waterproof. Behaviors such as failing to heel, chasing vehicles/animals, barking and jumping up are more than just a nuisance; they could land your dogs in a dangerous situation. Help them stay safe and well behaved with this efficient, humane training system. We hope our list of best shock collar helped you in choosing the suitable collar for your dog. Remote training collars, shock collars and electronic collars (e-collars) are very popular amongst pet owners due to their effectiveness during training. Whether you are trying to teach your dog not to leave the yard or even curtail the habit of persistent barking, shock collars provide gentle and efficient stimulation to train and prepare. Like any other behavioral training medium, shock collars, too, have their benefits and limitations. It all depends on what the pet owner perceives to be adequate and suitable for their pets. Here is some information that will help you better decide what is most appropriate for your pet before you make a purchase. During the 1960s, shock collars were popularly used among hunting dogs to train them to hunt. Over time, it became less popular as an aversive training tool and more of a behavioral modification tool. Most usually recommended to dog owners whose pets are stubborn and over aggressive (behavior which may not be desired in a home environment), shock collars have been proven to be highly effective if used correctly. Shock collars have also found to be useful in training puppies to walk with the pet owner — nearby or a within a certain defined space when not on a leash. 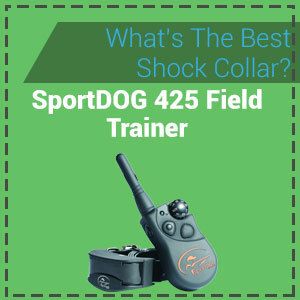 Intended to be used more as a deterrent rather than as a tool for punishment or ill-treatment– shock generated is just enough to catch your dog’s attention– shock collars are aimed at correcting behavior that is considered to be unsafe or contrary. In theory, this tool is more like a reminder in the form of an uncomfortable ‘zap’ associated with undesirable behavior or aggression. Gradually, as the dog is made aware of this recourse, behavior correction is achieved. Approved shock collars are known to be safe and do not lead to any physical harm. To reprimand the pet’s behavior, most shock collars are available with different levels of intensity which can be adjusted according to your training needs. 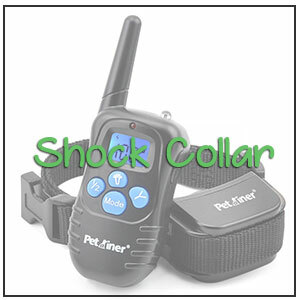 Some shock collars also come armed with an audible warning beep before a shock is administered allowing the pet owner to voice instructions to help the pet gradually identify what led to the shock in the first place thus assist the animal in identifying unwanted actions and behaviors. Besides behavior training, these collars are also used for boundary training as well. A mild shock is administered when the dog leaves the demarcated property line. The shock is triggered by underground wires placed along the border, training the dog to learn how far it can go and where it shouldn’t. The ‘shock mode’ on most collars can also be switched on and off as desired. Therefore, the shock administered isn’t continuous giving the pet owner complete control over its usage and also the different levels of intensity. The collar also works great as a deterrent against constant barking—there is a mild vibration around the dog’s vocal chords. For behavioral correction, there is a remote control that allows you to administer a shock whenever the unwanted behavior — behavior such as excessive barking, being over aggressive to family members, extreme aggression towards food, etc.— needs to be corrected. Here are a few pros and cons that will help you make a more informed decision about pet collars when you go out to buy one. Warning beeps or vibration alerts are available in most collars on the market along with several levels of power for shock delivery. The different types of strength work great to deliver very mild shocks if you aren’t too keen on this form of behavioral training. When it comes to correcting mild unwanted behavior, it is very common to see positive results after the first few shocks. Several pet owners have provided feedback saying that after just a few shocks, the vibration or the beep was enough to alert the dog. More stubborn dogs, however, would need more time but these shock collars have proven to be quite effective even with the most aggressive of pets as well. This form of behavioral correction does not require you to be physically present at all times saving you plenty of time and energy in the process unlike most other forms of hands-on training. With the help of shock collars, your pet can be trained for boundary control as well persistent barking quickly and efficiently. Depending on the features and specifications of the device, most shock collars range from anything between $25- $200, which is a whole lot cheaper than hiring a professional dog trainer. Usually, prices differ depending on the type of remote control devices, the distance covered and the adjustable warning/shock levels. A few pet owners find it difficult to fathom causing pain to their pet even though the degree of intensity is controllable. Fear can be instilled into the pet without leading to any positives while training. There is always the chance that your pet could then associate the fear of the shock with everything around it. Shock administered when you are not physically present can lead to shocks that are unintentional or confusing to the dog. This form of behavioral treatment does not enforce any positive rewards like affection from the owner, verbal approvals or even treats. So although it penalizes negative behavior, it does not reward positive behavior. Learn to train your dog using an e-collar. There are some helpful hints in this video. Keep in mind that shock collars are not tools meant to inflict punishment on pets nor used for torturing the animal, research has proved that they work quite effectively in training and help improve the bond you share with your furry four-legged friend. Either way, no matter the type of tool you decide upon, the right intention is to correct a form of behavior which will ultimately only help improve your relationship.